Recipe boxes are everywhere, from organic fruit and veg champions Abel & Cole and the healthier than thou Mindful Chef, to the globetrotting gourmet meals of Gousto. The latter aims to ship a whopping 400 million meals to UK homes by 2025. Looking for something a little more niche? How about the one for sweet-toothed vegans, a kids’ special or Italophile heaven perhaps? Although some question the sustainability of this industry, it hasn't taken long for Waitrose and other supermarkets to also join the fray. That’s because they know a good opportunity when they see it. The public’s appetite for quick, healthy and chef-y dishes is at an all-time high, yet many have never felt more time-poor. The answer could be a subscription-based service that spares them the supermarket, provides weekly inspiration and minimises waste. Instead, customers pick what they fancy and in a few simple steps they could be tucking into their own delicious creation. Well, sort of. But what if you usually sell ingredients rather than the finished product? Will customers be as keen to give it a go? Enter Red Rickshaw, the UK’s largest online Asian grocer. They supply everything from impossibly sweet Alphonso mangoes to Halal meat, ghee, exotic spices and aromatic pastes. Founder Jyoti Patel wanted to show the full breadth of Eastern cuisine beyond curries and stir-fries. So she decided to experiment with a project called Feast Box. Her aim was to give customers the confidence to create authentic and wholesome meals at home using Red Rickshaw produce. A better option than the takeaway, and a cheaper one than the restaurant. She asked me to write the copy for the soft launch website in less than a month. This was challenging for several reasons. Feast Box has a slightly different audience to Red Rickshaw so we couldn't lean too heavily on reputation. The product was still in development (particularly the back end) along with the brand identity. This made it quite difficult to find a tone they could own, and to get all the answers to those important FAQs. Ultimately, the copywriter’s role on a project like this is to be thorough, ask all the right questions and then to convey the key information in the most compelling way they can. Edge of Belgravia is in the vanguard of contemporary knife production. Over the past five years, the company has built a reputation for combining premium materials with bold design. But they wanted to go further, to create a set that could stand alone as a piece of art. To do it the way that he wanted to – exceptional quality at an affordable price – founder Freddie Ostlund needed help so he turned to Kickstarter. He then approached me to work on the guide script for a three-minute film. A director was already in place but this was his first attempt at a fundraising video and concept was quite loose. The core narrative needed to be refined, a structure established and a balance struck between the emotional and rational. Making a Kickstarter video is a tricky task. You only have a few minutes to tell your story, to get people excited about your product, demonstrate why it’s awesome and necessary, and turn viewers into committed backers. Edge of Belgravia smashed its £30,000 target in less than five hours. The campaign has currently attracted more than 700 backers and £170,000 in pledges. There are 1.1m people over 65 who are chronically lonely in the UK, with many more at risk of loneliness and associated conditions such as dementia. In 2016, Catherine McClen decided to do something about this by starting BuddyHub – a social enterprise that creates friendship circles for older people living in London boroughs such as Islington. Powered by people’s goodwill and boasting an easy-peasy onboarding process, the company offers a more flexible way to volunteer than the usual befriending schemes. Through BuddyHub, different generations can mix, share common interests and feel part of a wider community. Catherine asked me to help with her marketing strategy and to sharpen the proposition for both Buddies and Seniors, in short- and long form copy. Tone has been particularly important during this project. Elderly people are often patronised and/or ignored in this country. Instead team BuddyHub is compassionate and supportive at all times. We see the good in others and try to present a way forward in an upbeat and fun-loving manner. I have been working with Catherine for the past 18 months and it has been particularly rewarding to take part in conversations about social enterprise. How to make a real impact, and not just in a marketing context. Mother Brown Films founder Kevin Lee Brown is never far from a good story. While on holiday with his family in Bali, he discovered that they were staying in a treasured piece of folklore. Tandjung Sari was approaching its 55th birthday … and there was much to celebrate. Tandjung is the original boutique retreat, a handmade hotel situated on an idyllic stretch of Sanur beach. 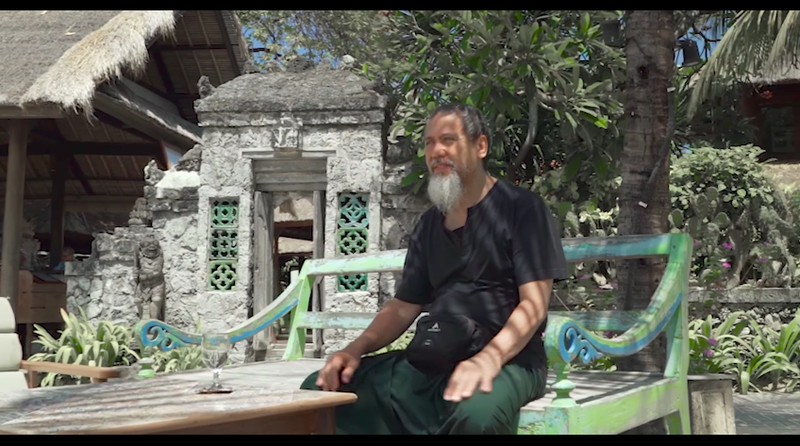 The vision of Dutch-Indonesian entrepreneur and Renaissance man Wija Wawo-Runtu (together with his wives Judith and then Tatie), Tandjung started life as a home and meeting place in the Sixties, later becoming a hotel almost without anyone noticing. Pre-dating the Hyatt and numerous other chains that have swamped the area, Tandjung represented a very low-key form of luxury. It was all about the simple pleasures: a serene and intimate atmosphere, local craftsmanship, warm hospitality and sumptuous local cuisine. The Wawo-Runtus really knew how to live and they wanted to share their experience. At Tandjung, guests could get to know the real Bali better. And they kept coming back, from newlyweds to celebrities such as David Bowie and Ingrid Bergman. That approach continues to this day. The current owners, Wija’s daughter Wita and her husband Avi, asked Kevin to produce a film that touches on the soul of Tandjung and explores why this is still such a magical place in 2017. Kevin asked me to help find the story and suggest a structure. Mother Brown Films asked me to produce a guide script for a short film about Xerox. This year the Fortune 500 business, which made its name by pioneering a series of print and photocopying technologies, became two publicly traded companies – Conduent and Xerox Corporation. Our job was to briefly explore the reasons for that separation, document the process and, above all, acknowledge the crucial role of the IT division. Trying to separate a company with 130,000 employees scattered across 180 countries was a daunting task. The strain on the company was significant, with the IT division having to work 600,000 extra hours. The film had to convey the scale of the challenge and the mood behind closed doors. 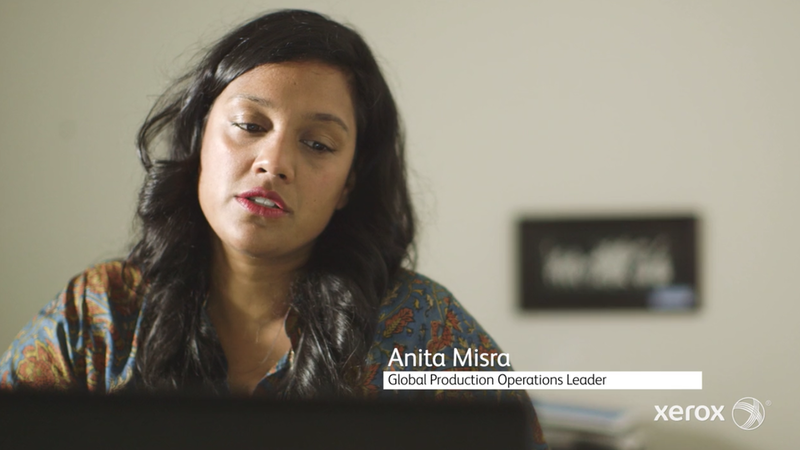 And rather than simply being a pat on the back for the IT division, an internal puff piece, the client also wanted the film to ponder the evolving role of Xerox in business. 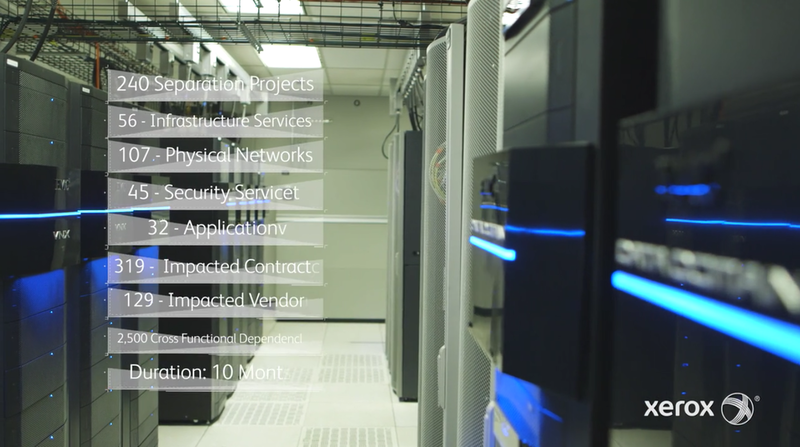 How the IT team would be moving out of the server room and into the boardroom. Joe Wilson, Xerox’s first CEO, talked about “better communications for better understanding”. Their current proposition is to find ‘a better way to work”. It makes perfect sense, then, for the company to expand its operations to incorporate workflow automation, analytics, greater personalisation and online security solutions. The new company structure reflects that scope, providing greater strategic focus and efficiency. Aside from the tight deadline, delivering an approved script for a three-minute film in 1-2 weeks, the complex nature of material was also a challenge. So we conducted lengthy interviews with everyone from outgoing VP Andrew Campbell, to VP Marketing & Global Brand Tracy Yelencsics and Xerox CEO Jeff Jacobson, peeling back the layers of jargon and searching for clear insights. Thin Martian asked me to write the copy for a gaming hub that would sit on PC World’s website. The aim was to demystify gaming for a mixed audience of entry-level and enthusiast gamers. After exploring this hub, they should know more about what makes a good gaming PC and why they should choose Windows 10. Besides explaining the function of each component and performance-boosting features such as DirectX 12, the goal was also to get readers excited about stepping up to a better gaming experience. So the copy needed to be more than just informative and accessible. It had to have a little “edge” and be witty and dynamic, in keeping with the personality and energy of the design. Aneeka Patel, a sharp and highly ambitious legal professional, approached me about working on her first solo venture. Pouring all her experiences and frustrations about the dating world into Project 143, she decided to create a personal matchmaking service for underserved South Asians in London. Not a day goes by without the launch of a new life-changing app or site for hopeful romantics. For thrillseekers, there are always "hook-up" specialists such as Tinder. But if you are born into one culture and raised in another, how many companies will be able to work around those nuances and complexities? For many, there is still a stigma attached to any kind of arrangement or introduction. This is the age of instant attraction, after all. Discretion and honesty are also important, which is why apps and algorithms pose their own set of issues. This audience is extremely busy, they know what they want (almost to a fault) and they're not willing to settle like their parents may have done. So what's the answer? Aneeka wanted to offer clients handpicked suggestions and guidance, much like a friend would. By combining guaranteed introductions to people in this network with a very human approach to finding love – not least through relationship and life coaching – she felt this would deliver a winning combination of optimism and pragmatism. Apart from translating Aneeka's vision into clear and comprehensive copy, my challenge would also be finding the right tone. Empathic and uplifting, pally yet professional, fun yet focused. In the space of a few years Digital Archaeology has evolved from DIY show to international success story. It has been a star attraction at Internet Week, both in London and New York, earning keynote presentations by the British Library and the Library of Congress. In 2013, it was visited by the team at CERN responsible for archiving the first website and is now part of the Barbican’s hugely successful Digital Revolution exhibition. So what’s it all about? Founder Jim Boulton fears that the early years of the web will soon be forgotten. There are 48 copies of the Gutenberg Bible – the first book to be printed using moveable type – yet no evidence of the first web page. Not even a screenshot. Jim is an ambitious, relentless kind of guy. He wants to continue these digital excavations but needs a corporate sponsor to help him pop up at important digital culture events such as Slush (Helsinki) Web Summit (Lisbon) and DIGIT.EMEA (Istanbul). He wanted to reflect on the journey so far and asked me to help create a brochure that would celebrate past achievements while also plotting a course for the future. I flatplanned the brochure, co-wrote and edited the copy and made design suggestions along the way. To assist TSP with a new website that would reflect their evolution from specialist Apple IT support company to growth consultancy. A trusted adviser at the table rather than the guys you only call when something's broken. The client also wanted to make home automation, a major growth era in the US, a core part of the business. It was necessary to gain a deep understanding of the TSP way and how that is brought to life, both at the office and in the home. 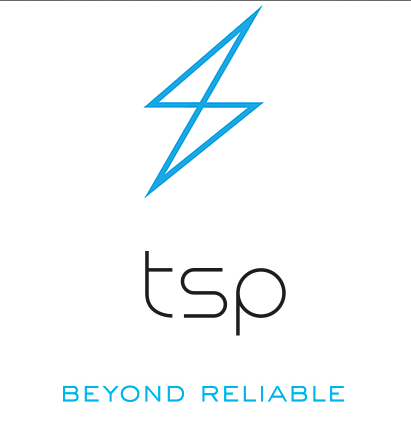 I have been interviewing key stakeholders, conducting industry analysis and benchmarking, creating a new brand identity with tagline, establishing a tone of voice, writing TSP's story and team profiles and articulating core propositions and processes. I have also refreshed white papers to bring them in line with the new tone and positioning. This has been a very interesting project and I really admire the broad vision of the owner. He wants to create a robust, and ultimately more invisible, IT system for clients, whether they run a start-up in Boston or live in a penthouse apartment in Iceland. And he wants to do it with precision, simplicity and style. To develop copy for a series of Bing banner ads, launched at the start of the FIFA World Cup 2014. The aim was to place Bing at the front of football fans' minds when it came to searching for all the latest news, fixtures and results. Not an easy task at such a noisy time in the year. The proposition is that with Bing you can instantly find what you're looking for. Travel – a universal theme – seemed appropriate for such a massive event in the sports calendar; a good way of getting people excited about the tournament and its exotic location. The 'road to Brazil' now becomes a month-long journey of ups, downs, twists and turns, with in-flight entertainment provided instantly by Bing. One key challenge was to be very concise and clear in the messaging and calls to action as these banners were going to be translated into other languages. To write copy for the website of a young London-based venture capital company that promises to be more flexible, agile and approachable than the rest. Brompton Ventures' point of expertise is gambling systems, a major growth area due to rapid technological innovation and the convergence of gambling and social gaming. However the company was also keen to meet investible entrepreneurs with opportunities in other sectors. So the challenge was to succinctly define a company very much in 'a state of becoming' – using optimised copy but minimal content – and to convey a more collaborative approach to business development. Corporate finance can be a notoriously dry industry but it is still a business about people, ideas and the conviction to see them through. That takes character. And if you have it, show it. To write copy for an e-commerce website that would function as a responsive showroom for an LA-based client's glamorous range of mobile technology accessories. Think iPad covers that are shoulder bags, purses that are smartphone cases and Bluetooth devices that are bracelets. Although this range was eye-catching in its array of on-trend colours and attractively portrayed through photography assets, the challenge was to make Devieta clearly stand out to an international customer base – and in a congested sector of the fashion industry – by emphasising the brand's problem-solving ability. The client has an acute awareness of customer needs and a knack for producing fashionable, well-crafted items that fit into the everyday lives of today's mobile multi-tasking generation. To these luxury-craving go-getters, small things can give inordinate pleasure. After a lengthy period of product research and competitor analysis we settled on this proposition: "the ultimate travelling companion". The product descriptions, essentially real-life scenarios, flowed from there. To conduct keyword research and write optimised category/product copy for this rapidly growing interiors platform. Topics ranged from choosing a reliable home builder to selecting the right cot bedding for your little one. To compile, write and edit an A6 perfect-bound "success study" brochure for content marketing agency Story Worldwide. This was essentially a calling card for the agency and, more importantly, a celebration of their work on behalf of premium car brand Lexus, for whom the agency produced a highly effective international editorial programme for about 10 years. During that time, Story created all forms of content, from a quarterly magazine with localised issues (the most awarded in the history of customer publishing) to e-newsletters, short travel films and a content-rich website of latest news and features. A lot to fit into a small package while also leaving room for a magnificent archive of commissioned Lexus imagery through the years.